Out of the Ophir checkpoint the trail follows a cat trail along the Innoko River into the old village site about a mile further along. It crosses the river again six miles out of the checkpoint. From the crossing, the trail heads northeast. The terrain is flat with sparse scrub spruce with a few rolling hills as it approaches Cripple. Cripple (krip-uhl) — Lat. 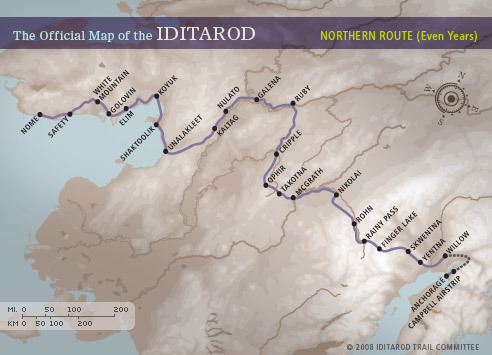 63.41 N Long 156.20W – Population 0 — Part of the famous Iditarod Mining District, which saw $35 million in gold taken out of the area between 1908 and 1925. Not bad when you figure that gold was only worth $20 an ounce in those days. This checkpoint marks the “official” halfway point in the race on the northern route.